One of the oldest tricks to securing a guitar strap to the end pin of a guitar was by inserting a rubber washer over the end pin. The Pad Lock strap puts its own spin on this technique by attaching the rubber piece to the strap. No extra parts, no installing hardware. It's as easy as putting on the strap and pulling the rubber tab over the end pin. Adjustable from 35" to 59.5" and made of 2" wide black tubular nylon. The D'Addario Hybrid Strap combines the strength and quality of a leather strap with the easy adjustability of a woven strap. Each strap features an Eco-Leather top and matching strap end (repurposed leather), backed with "Super Suede" (synthetic suede),and a polypropylene woven end with a brushed die-cast zinc adjuster. 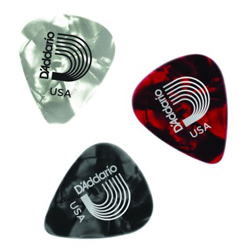 D'Addario Reversible Leather Straps give the player two strap styles in one. Sold in a variety of colors, each strap is 3-ply garment leather and adjustable from 41" - 60"
Black Geometric pattern on an auto lock strap. Corduroy Straps 2" width, adjustable from 30"-55"
Woven guitar straps feature original hot rod art and are made of tubular nylon for maximum comfort and are adjustable from 35" to 59.5"
Hootenanny Straps 2" width, adjustable from 30"-55"
Classic Tweed Straps 2" width, adjustable from 30"-55"
D'Addario combines the classic Black Polypropylene guitar strap with embroidered art of the iconic "The Beatles" logo.